Hello guys ! I am really pleased to let you know that beginning today, I'll be on vacation all next week ! Not much, but it's enough to try and recharge my own personal battieries. To start these days in a relaxed mood, we have a casual outfit post, featuring one of the hottest trends of the moment: the number print t-shirt, for a sporty chic look. The basic rules for these tees are: they have a printed number on the front, just like football or basketball players tees, they're larger than average (pick a larger size to make it look as if you stole it from your boyfriend's closet) and you are supposed to mix them up with something extremely feminine, just like high heels and a clutch, like I did. Ciao a tutti ! Sono lieta di informarvi che, a cominciare da oggi, sarò in ferie per tutta la prossima settimana ! Non tantissimo, ma abbastanza per tentare di ricaricare le mie personalissime batterie. Per iniziare queste giornate con un mood rilassato, ecco un outfit post casual, incentrato su uno dei trend del momento: la maglia con numero stampato, per un look sporty chic. Le regole di base per queste maglie sono: hanno un numero stampato sul davanti, proprio come le maglie dei giocatori di football o basket, sono più larghe del solito (sceglietene una di una taglia più grande per far sembrare come se l'aveste rubata dall'armadio del vostro ragazzo) e andrebbero indossate con qualcosa di estremamente femminile, come i tacchi alti ed una clutch, come nel mio caso. I highlighted the sporty look with black side band pants made in light fabric. Since the whole look was focused on black and white, I added touches of yellow, inspired by this cute leather bag I got from Persunmall. This bag can be worn also as a crossbody bag since it has a detachable chain shoulder strap. I decided to take it off and opt for the clutch version. See the bag better in the pic below. Ho enfatizzato il look sportivo con pantaloni dalla banda laterale in tessuto leggero. Dato che l'intero look era in bianco e nero, ho aggiunto tocchi di giallo, ispirata da questa carinissima borsa in pelle di Persunmall. Questa borsa può essere indossata anche a tracolla, dato che è fornita di catena staccabile, ma questa volta ho deciso di toglierla e usarla come clutch. Potete vederla meglio nella foto sotto. I added a few touches of yellow to this look with my China Glaze nail polish and an old H&M necklace. Mirror sunglasses completed the outfit, together with these shoes you can see better in the pic below. Ho aggiunto qualche tocco di giallo al look con lo smalto China Glaze ed una collana H&M. Occhiali a specchio hanno completato l'outfit, insieme alle scarpe che potete vedere meglio nella foto sotto. 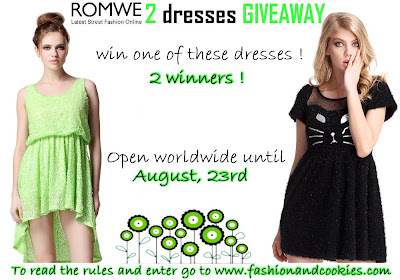 You can win one of these two dresses with this lovely Giveaway, open until August, 23rd ! 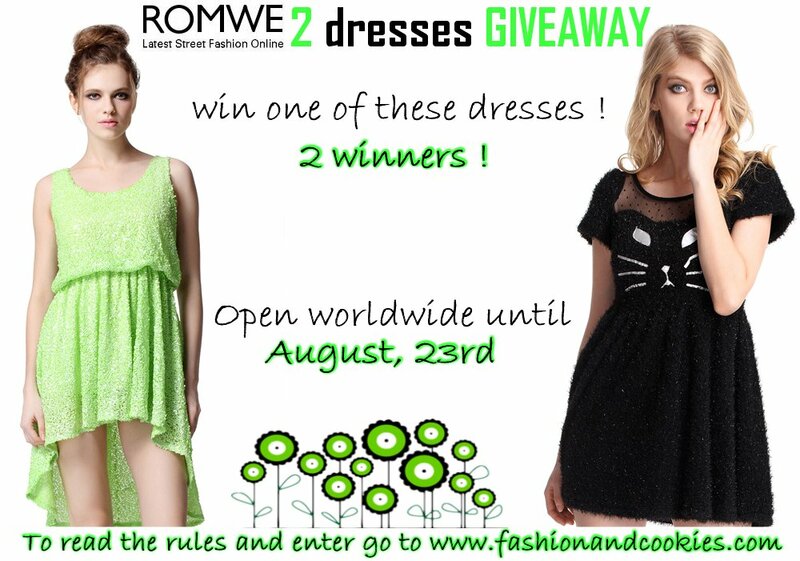 Two winners, one dress each ! Click here to read the rules and to enter ! Il look sporty chic credo ti doni particolarmente, sai indossarlo con leggerezza e classe. La borsa poi è davvero bellissima! Love these kinds of tees for comfy but chic summer looks. You make every outfit your own and very chic! Great sporty outfit! I like your blog setup! 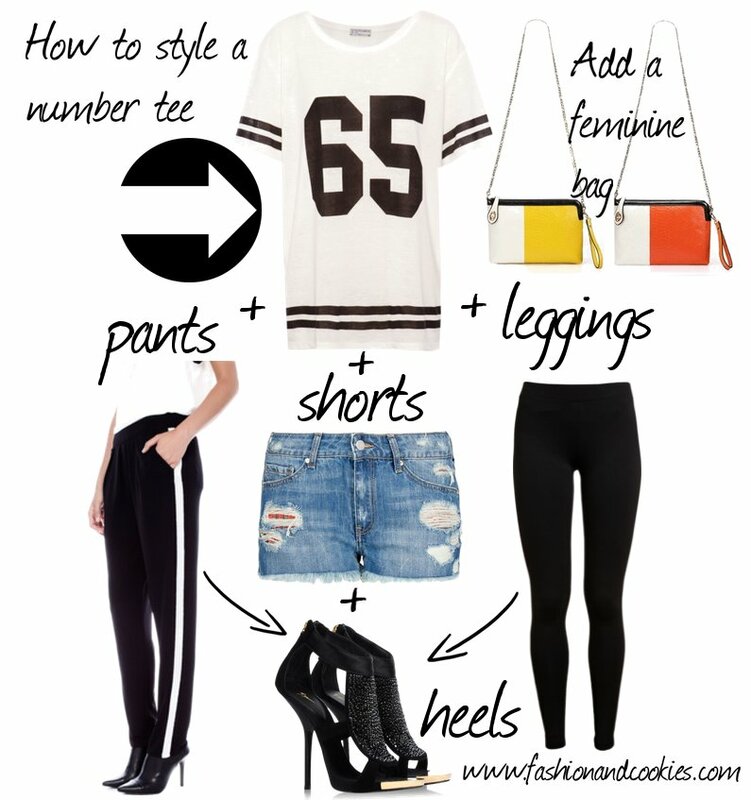 The outfit pics followed by the formula is a really cute idea! I love this sporty chic outfit! Ciao Vale! Anche io adoro questo trend, l'hai abbinata benissimo con i pantaloni e i dettagli che danno un tocco di colore!!! Bellissime anche le scarpe *_* Un bacio cara! love this look soo much! number print is very trend for a long time.it is a preferred item for young girl.in addition i love your bag.PLEASE visit my blog. lovely post! You are so chic. This is one of the best look that I saw this week! Mi piace tantissimo questo trend delle tshirt maxi stile basket e tu l'hai abbinata benissimo, con femminilità e gusto! oooh e allora buone ferie!!! Quando ci vediamo per una partita di football??? Ah ah ah scherzo, mi piace molto come hai saputo interpretare sia la tee che i pantaloni, anzi i pantaloni me li comprerei volentieri! How great, that you have vacation now! For me it´s the same, my holidays started on Thursday and I have the completely next week free! Hope you will do many great things with your hubby - together with my lovely husband I enjoy already the vacations and today we visited a wonderful sea here in our region. E' vero hanno spopolato quest'estate le tee da basket, a me non piacciono in modo particolare, ma devo dire che abbinate agli accessori giusti possono anche trasformarsi in un capo dal perfetto mood ispirato ai mitici '80s! Ma come fa a vergognarsi tuo marito se sei perfetta con questo look?! I like the pants/tee/clutch combination! Buone ferie, Vale!! Ti dona molto questo look sporty chic!! La pochette è davvero stupenda!!! Mi piace un sacco questo look! Bianco, nero e giallo stanno benissimo insieme! Hai reso subito chic questa shirt un po' maschile! NEW POSTS ON MY BLOG! Stai molto bene, mi piace come hai abbinato questa tee così sportiva a dettagli super femminili! wonderful look dear. i love this tee. and the bag is amazing. Da me c'è un nuovo post... "on the road" ..fammi sapere cosa ne pensi! Vale ti trovo semplicemente perfetta e mi piace ogni dettaglio... La tee, la borsa, i pantaloni tutto! You look so pretty !! Amazing shirt !! In love with your sporty chic look! La collana mi piace moltissimo! Very cute! I love your necklace :) Have a good vacation! Check out my new post of my Summer Favorites!! would yuo like to follow each other? Love this look, I think if you are gonna wear this kind of a tee, you should rock heels with it, like you did! Perfect look! Everything is amazing! Ecco che mi pento di non aver acquistato questo tipo di maglia quando ne avevo l'occasione! Le ho un po' snobbate, ma in effetti con questo look sporty/femminile risulta sfiziosissima! Bella Vale, amo le scarpette soprattutto!